The Sandra Brown books in order of reading consist of her numerous standalone novels. As such, they can be read in any order you prefer. Sandra Brown is, in my opinion, the queen of the romantic suspense genre. I have been reading her books for the last 30+ years and was never disappointed in any of them. The author definitely knows to appeal to our emotions, while infusing her books with the much-needed action and suspense. With over 70 novels written to date, Sandra Brown has definitely earned her place among the best of the best in this genre. Here are the Sandra Brown books in order for her romantic suspense novels (contemporary romance novels are not listed here). Since they are all standalone novels, you can, of course, read them in the order you choose. I will the list in reverse publication order, from the newest books to the first one written. Sandra Brown was born in 1948 in Waco, Texas. She grew up in Forth Worth, majoring with a degree in English lit at the Texas Christian University in Fort Worth. Sandra grew up surrounded by a family love for books, with her mother being an avid reader and her father a newspaper editorial writer. Thus, Sandra Brown was first a strong book lover before she became an author. In 1968 she abandoned college in favor of getting married to Michael Brown, an ex-TV news anchor who produced the TV documentary Dust to Dust earning him several awards. Currently, as a lifelong Texan, she lives with her husband in Arlington, Texas. Like numerous authors as well, before becoming a full-time writer, Sandra Brown held several jobs. She worked for KLTV in Tyler as a weathercaster, after which she returned to Fort Worth to work as a journalist for WFAA, basically in the media, for the ABC affiliate in Dallas. When she was fired from her job as a weathercaster at a television station in Dallas along with many other people, this is when her husband gently nudged her to become a writer. He told her that she has now a lot of time on her hands, and it’s time to follow her dream of becoming an established author. Getting fired from her job was the silver lining in her life, giving her a chance to become what he was meant to be. Her first book was published in 1981 with the title Love’s Encore, which she wrote under the pseudonym, Rachel Ryan. Over the years she also wrote under the names Laura Jordan and Erin St. Claire. So far she has written over 70 books, which include romance novels, historical romances and most of all romantic suspense/thriller novels. Her first romantic suspense novel was written in 1988 under the title Slow Heat in Heaven. It was also the first book I have read by Sandra Brown. Her books have been printed eighty million copies worldwide and they have been translated into over 30 languages so far. She has an honorary Doctorate of Humane Letters from Texas Christian University and at some point, she was president of Mystery Writers of America. For her books, the author has received several awards including the American Business Women’s Association’s Distinguished Circle of Success, the Romance Writers of America’s Lifetime Achievement Award, the B’nai B’rith’s Distinguished Literary Achievement Award, the Texas Medal of Arts Award for Literature and the Romance Writers of America’s Lifetime Achievement Award., and the A. C. Greene Award. The author is a member of Author’s Guild, International Association of Crime Writers, Mystery Writers of America, Novelists, Inc. and Literacy Partners. In 2011 the author Sandra Brown went on a USO tour to Afghanistan with four other colleagues, including Clive Cussler, Mark Bowden, Kathy Reichs and Andrew Peterson. The group went to meet the brave soldiers fighting in Afghanistan and to thank the troops for their service. All these authors have written military mysteries and thrillers. Thus, when she went home and started thinking of her next book, she had several ideas about civilians who return from the trenches with PTSD. So, her next novel, Deadline, features the main character, Dawson Scott, a news magazine journalist who covered the war in Afghanistan and went home with PTSD. Sandra Brown drew some of the ideas in her book from her trip to that war-zone country. She also gets many of her ideas from a character that she envisions in her mind. Sandra Brown writes approximately one novel per year (they usually come out just in time for the summer holidays, making for some wonderful beach reads). A favorite novel by Sandra Brown is titled Seeing Red, published in 2017. The book features a journalist (a theme which reoccurs in the Sandra Brown books) and John Trapper, a former ATF agent. When an old photo resurfaced with Kerra Bailey, the journalist and John Trapper’s father, all hell broke loose. Not only that, but someone didn’t want the photo given too much attention due to something that happened 25 years ago. In fact, he wants that so much buried that he is able and willing to kill for it. The book is a suspenseful romance which keeps you on the edge of your seat all the time. But then again, Sandra Brown’s books tend to do that to the readers. So when you start it – or any other Sandra Brown books – make sure you have plenty of time to read, because once you start, it’s not so easy to put her books down. 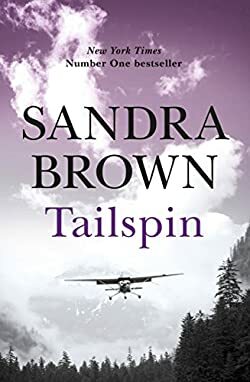 The latest Sandra Brown book is Tailspin, published in August 2018. It features Rye Mallett, a charter pilot who doesn’t have any qualms about taking dangerous transporting jobs when others avoid doing these trips. This latest trip, however, takes place during an extremely bad weather and the cargo is something strange as well. Especially when Rye is shot at and almost killed while landing. Enter Dr. Brynn O’Neal, who states that the cargo is really hers, and who gives a really strange vibe off to Rye. Can he trust her, and will trusting her lead to anything good, or only to his utter deceit? I admire her so much after reading her story. What a strong and amazing woman. AND she lives in Texas, like me! That is awesome. I love a great suspense book. I have been looking for something new to read, I will have to look her up and read a few. I am pretty sure I have read one or more of this author’s books–but before I began reviewing them. I think I better check out some of them again–starting with her latest! It’s really amazing to see how her writing evolves over her life and how it relates to her life as well! Now she is a perfect example that you can do anything in life. Love to hear and see everyones accomplishments in life. Wow, what a career writer she turned out to be. Thirty books is massive and all those printed, even in many foreign languages. I’d love to check out some of her historical romances at some point. My daughter and aunt would this last book. Great gifting idea.